December is the month where lots of parties and events happen, and that means the need for adding some new essential pieces into your wardrobe. I've picked out some fab pieces and I am definitely going to have to invest in quite a few of these items to cover me for the festive period. I love how simple this Zara Lace Dress is, and how reliable this would be. Due to it's simplicity you would be able to wear this throughout December on a variety of occasions. You would be able to dress it up and down, to suit the occasion. This ASOS Geo Sequin Mini Dress is the ultimate party dress, if you have a big party or occasion this month, then this is a perfect investment. For £100 it is not cheap, but I totally adore all the sequins and sparkles. I have been loving big, cosy jumpers which are longer, and you can throw on with a pair of leggings, and your ready to leave the door. The Topshop Venice Sweat Dress for £30 would be a perfect addition to my wardrobe for the winter season. I originally saw this Tesco Art Deco Sparkle Dress advertised in my magazine as a must have item for the party season, and it totally is. The price is just £14, which is a total bargain. It would be perfect for a works Christmas do, Christmas day or a New Year's outfit. This River Island Grey A-Line Skirt is a real beautiful item, I am definitely going to pick this up to wear over the Christmas season. At £35, I think it a really great price for the detailing on the skirts, and it is a very versatile item.I have been wanting a new jacket for a while and this, ASOS Suede Biker Jacket in Oil Wash is the perfect colour for this season. It is an investment piece as it costs £110, but this will last you years if you look after it. It will be a timeless piece which you can rely on time and time again. I adore check print, so I naturally instantly fell in love with this Topshop Petite Check Shirt Dress which costs £39. I love how big the check prints are, and I don't have any check shirts which are monochrome, so this would make a perfect addition to my wardrobe. This print of this Zara Jacquard Dress, is really unique, but I also really like it. Zara each season realise this type of dress, and I really love them as they are so easy to wear. I would pair it with some thick black tights, some ankle boots and my leather jacket. These Miss Selfridge Striped Wide Leg Trousers are a piece which I would not usually gravitate to, but I really like how statement and bold they are. I would pair the trousers with a simple crop top and some big chunky black heels. 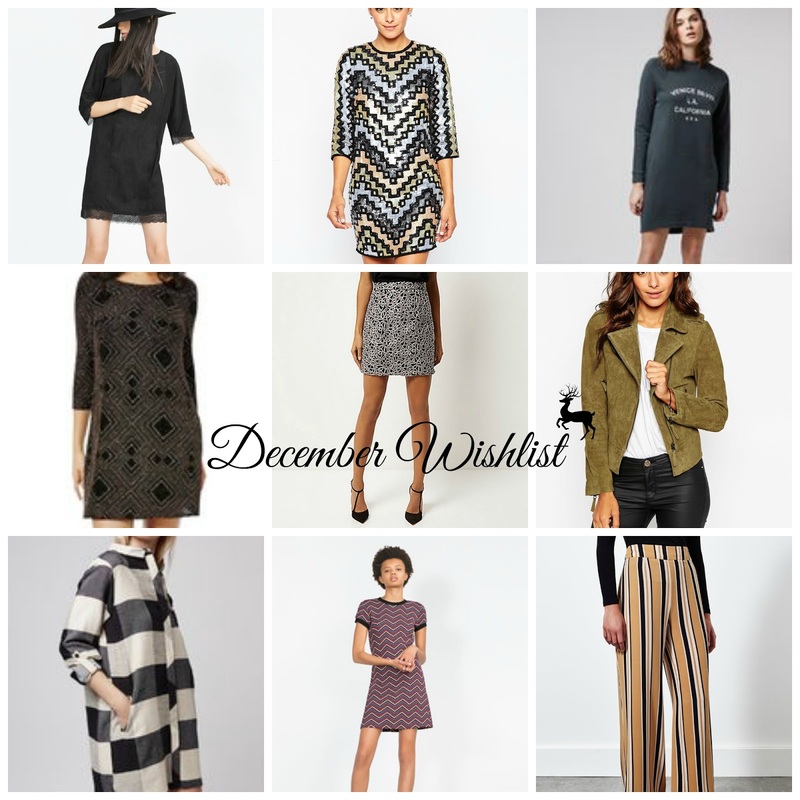 Do you like any of the pieces in my December wishlist?